The Reagan-era judicial battle everyone remembers has to do with Robert Bork's nomination, and in the wake of his death, there's been a lot of discussion of that episode. Lots of ink has been spilled arguing that he was treated unfairly, and I really don't find it convincing. As Scott Lemieux argues, Ted Kennedy's speech attacking Robert Bork's views on abortion and other issues was accurate. And as David Greenberg argues (via Bernstein), Bork's defeat wasn't unprecedented either. The person who I think really didn't get a fair shake was Reagan's subsequent nominee. Nominated when Bork was defeated, Douglas Ginsburg withdrew after it was revealed that he had smoked marijuana even after becoming a professor at Harvard. I suppose it was embarrasing for Reagan, who started the War on Drugs, to have a nominee who had smoked marijuana. But in any event, this wasn't a good reason to reject a potential Supreme Court Justice. I don't know enough about Ginsburg's views to comment on whether he should've been confirmed in the end. 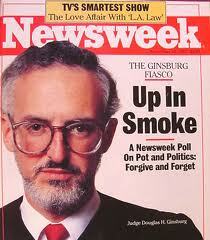 But I do think he deserved to be considered on the basis of his judicial views rather than his marijuana use. I think he had not just smoked pot, but gotten high with his students. Again, not exactly fair today, but that made the whole thing a little worse. With his students! I get your point, but I think that just makes him more awesome. At the time, even marijuana use as "youthful indiscretion" was barely tolerable politically - remember Clinton's "didn't inhale" from 1992? So smoking dope while a responsible adult was just way beyond what the times would allow. And smoking with his students - well, just triple that in terms of unacceptability. Maybe Nixon could go to China, but there was no way Reagan could stand behind a nominee with that record of pot smoking, especially after years of our having to listen to Nancy Reagan saying "Just Say No."